Co-authored/painted paper by Aboriginal and 'Western' authors primarily focusing on spiritual issues in law. This chapter discusses issues associated with the capacity of western law in understanding and protecting indigenous knowledge related to the bioprospecting of indigenous medical knowledge in an Australian context. More specifically the focus is upon indigenous spiritual knowledge. It is suggested that central to this project is the right of indigenous peoples in self-determination, self-identification and the right of verifying the authenticity of representations about such knowledge. Indigenous Peoples and Nations share a unique spiritual and cultural relationship with Mother Earth which recognises the inter-dependence of the total environment and is governed by the natural laws which determine our perceptions of intellectual property. Inherent in these laws and integral to that relationship is the right of Indigenous Peoples and Nations to continue to live within and protect, care for, and control the use of that environment and of their knowledge. Within the context of this Statement Indigenous Peoples and Nations reaffirm their right to define for themselves their own intellectual property, acknowledging their own self-determination and the uniqueness of their particular heritage. Within the context of this Statement Indigenous Peoples and Nations also declare that we are capable of managing our intellectual property ourselves, but are willing to share it with all humanity provided that our fundamental rights to define and control this property are recognised by the international community. These concerns require a genuine consultation between cultures. This is not only reflected in the subject matter of this chapter, but also in that the chapter is co-authored in a research relationship between an indigenous author and an author of Western cultural background. The indigenous author (Hunter) also created and presented a painting in the conference co-presentation prior to the reading of this chapter. The sophistication and multiple levels of knowledge represented in the painting represent a comprehensive system of indigenous knowledge that would take a number of years of education to appreciate. Although it will not be immediately obvious to western viewers of the painting, it actually represents a more comprehensive expression of knowledge than this chapter itself. Such a context is also symbolic of discussions in the chapter about the capacity of law in general and Intellectual Property Rights (IP) specifically to understand and protect indigenous spiritual knowledge. It is valuable for persons from western contexts of law to become concerned with the building of bridges between cultures that is required in such a process. Enduring bridges appropriate to such a relationship require the infusion of a number of spiritual virtues including humility, integrity, patience, transparency, respect, and trustworthiness. These spiritual principles must be applied in a framework honouring the sacred obligations associated with becoming a custodian of particular forms of knowledge. On a material level, those concerned with building economic bridges through which valuable transfers of knowledge can occur should be ultimately concerned with ensuring such spiritual concerns of indigenous people are considered and applied. The degree to which this is authentically engaged will determine the degree to which indigenous communities feel confident in sharing their valuable knowledge across that bridge. Alternately, many indigenous peoples feel a sacred obligation to respect the sources of that knowledge to the degree that they would prefer letting it ‘return to the earth and the spirit world’, rather than be misused and denigrated. For indigenous people the apparent physical loss of such knowledge does not mean it is gone forever. Such knowledge will continue to exist in the invisible world, hidden from the eyes of all, until people of respect and wisdom are found worthy enough to be given its gift again. The ultimate benefit of a genuine engagement with indigenous peoples and their knowledge represents a great gift to humanity. It is argued that this represents the greatest opportunity for the creation of a legal and social culture that manifests a true ethic of ecologically sustainable development, and is essential for the survival of the human species. In our attempts to formulate appropriate intellectual property laws for the protection of indigenous knowledge it is easy to be distracted by the apparent technological novelty of modern biotechnology industries and “sudden” awareness of the enormous economic value of bioprospecting in our modern context. Often one gets the impression in current literature that bioprospecting is made possible by recent increased capacities in the biotechnology industry and often the focus is upon the nearly exponential growth rates in patenting activities (Reid 1994) and economic growth. The reminder that history repeats itself (and that we often forget such repetition and thus fail to learn from it) is valuable for our discussion in our focus upon the “new” industry of bioprospecting and the appropriation of indigenous knowledge. The collective memories of indigenous peoples are often long and tell a different story. Bioprospecting is one of the oldest industries in the history of civilisation. Every civilisation has been dependent upon the extent to which they developed knowledge of their biological resources and to what degree they sustainably used that knowledge in supporting their needs of agriculture, medicines, and other industries. Equally so, unsustainable bioprospecting practices and the manner in which those resources were unsustainably exploited played no small part in the demise of a number of great civilisations and is a watershed moment upon which our own civilisation now faces. The appropriation of such resources from indigenous peoples by the dominant cultures has also been an ancient part of this industry. It has been said that Christopher Colombus was, among other things, an archetypal bioprospector in search of the East Asian “Island of Spices” who instead found a Caribbean island and began a familiar process of transferring the countless genetic resources from indigenous peoples to the developed nation states of Europe (Auer 1998). Accompanying this “transfer” of intellectual property is something far more sinister than mere issues of ownership and theft. This is not an appeal to historical injustice to garner moral appeal for more comprehensive intellectual property rights as a manner of restitution for past injustices. The value of acknowledging this in current IP discussions is for a number of reasons. First it is to remind us of the accompanying contexts of indigenous genocide that inevitably become associated with such “transfer” processes. While such appropriation may not in itself cause the cultural genocide, it is symptomatic of the overall objectification and devaluation of the subordinate indigenous cultures by the dominant cultures which is the primary cause of such cultural genocide. Such historical patterns of genocide are not footnotes in an elementary school-book but are very real present-day realities. UNESCO reports that 4,000 to 5,000 of the 6,000 languages in the world are spoken by indigenous peoples (UNESCO 2003). 2500 of those indigenous languages are under immediate threat of extinction in the present generation, and it is also estimated that 90% those indigenous languages that make up the majority of the worlds cultural diversity will become extinct in the next 100 years (Skutnabb-Kangas 2000). Acknowledgment of the interdependence of the link between cultural appropriation and cultural genocide is important to IP because ultimately it reminds us of the true gravity and importance of our discussion in that the implications of a wise focus include not just the protection of unique knowledge, but the very protection of human lives and communities. This naturally leads to the second value for IP discussions in the recognition of integrated indigenous needs. Such recognition supports the movement towards integrated legal regimes of IP, Human Rights, and Environmental Law, that don’t just protect the knowledge of indigenous peoples, but protect the indigenous communities themselves and allow the capacity for self-determination that ultimately facilitates the preservation of such knowledge. A commonly accepted estimate in the literature indicates that a full 77% of all plant related pharmaceutical products (Farnsworth et al., 1985), or roughly 25% of the entire pharmaceutical market (Duke, 1993) contains significant elements of direct contribution from the appropriation of indigenous knowledge. The figure of 77% becomes even more significant when one considers that the World Bank recently estimated that plant related medicinal products would reach a global value of US $5 Trillion dollars by 2050 (Gupta 2004). Apart from modern pharmaceutical usage, traditional systems of medicine and alternative and complementary medicine represent up to 50% of use in many industrialised countries and up to 80% in many developing nations (Bodeker G. and Kronenberg F, 2002). Combining the indigenous contribution to pharmaceutical medicine with its traditional use world wide indicates that indigenous knowledge may be responsible for over 60% of medical treatment in developed nations and 85% in developing nations. Against this global context it is important to note that Australia possesses greater potential for productive bioprospecting than any other developed nation in the world. This is due to its high levels of endemic biodiversity that place it 1st among developed nations and 6th globally on the National Biodiversity Index, (UNEP, 2001) while this biodiversity is 90% endemic. (Beattie 1995) Combine this with its equally high level of Indigenous cultural diversity, and the potential for the exploitation of Traditional Knowledge in facilitating the bioprospecting industry becomes apparent. The appropriation of medical products and knowledge of indigenous people in Australia has a long history that predates British colonisation. One of the earliest examples that we have goes back to at least the early 1600s, with the trade in trepang (also known as Sea Cucumber). Macassan fishing boats from Indonesia brought fishermen to the northern coastline of Australia searching for trepang. This was traded and sometimes fought over with Indonesian merchants who would then sell this delicacy to the Chinese market. Among other uses, it was dried and used for its numerous medical properties, including reduction of athralgia, atrophy of the kidneys, impotence, and many other medical uses (Dharmananda S). Most recently Japan has patented a compound from the Sea Cucumber, chondroitin sulfate for HIV therapy (Kariya et al., 1990). Modern research is also focusing on its anti-inflammatory and anti-cancer properties. More recently, in the 1980s the United States National Cancer Institute was granted a license to collect plants for screening purposes by the Western Australian Government. A healing plant traditionally used by the Nyoongah people, the Smokebush (Genus Conosperum), was found to contain the bioactive compound of Conocurovone, which is capable of destroying the HIV virus in low concentrations. The NCI sought further samples and a licence to collect more samples in Western Australia. The Department of Conservation and Land Management (CALM) attempted unsuccessfully to negotiate a contract with the NCI (Janke & Quiggan 2005). When after four months or so had gone by and there was no contract agreed between Western Australia and the NCI, the collector attempted to leave the country with the samples. He was found at Tullamarine airport with two of his three cases full of smokebush and other plants” ((N Marchant, C Bailey and J Cannon reported these events in M Parke and C Kendall, ‘Bioprospecting of Traditional Medical Knowledge’ (unpublished paper, Murdoch University School of Law, Perth, 1997, Cited in Janke and Quiggan (2005). It is interesting to note that while subsequent information in 2005 appears to indicate that this particular medicine was ‘shelved’ under the claim that clinical trials found it to be neurologically toxic in the oral method of treatment developed by AMRAD. Dr Gregg Smith, an Australian biotech scientist at AMRAD, who after expensive phase one testing and scientific dead-ends, was forced to shelve research with Smokebush’s synthetic compound concoverone. Known as a clunky compound, Smokebush’s concoverone is apparently too robust and cannot be broken down or ingested safely by humans infected with HIV (Williams). It is reported that an executive in AMRAD has admitted that at no time did they consult with the original community to discuss Nyoongah preparation methods or drug application and did not want to listen to any information related to demonstrating the indigenous source of the medicine when offered a description by the interviewer (Williams). In this case one could surmise it may have not only assisted in appropriate benefit sharing protocols, but possibly made a significant difference to the success of the HIV medicine as the Nyoongah people utilized the plant through different preparation processes and a final inhaling application rather than ingesting it orally which AMRAD developed separately. This highlights the lack of consultation processes between the bioprospectors, government institutions, pharmaceutical representatives and the indigenous community members and the possible loss to society this may have caused. It seems from initial interviews that the local community members are completely unaware there were even major research and development projects involving their original plant knowledge (Williams). Muntries is a native plant that’s well-known to local Aboriginal people; they ate the fruits and dried them to trade with other tribes. In 1996 provisional plant breeders’ rights for muntries were granted to a company called Australian Native Produce Industries. By taking this native plant and breeding it, the company obtained the exclusive right to use this cultivated species of the plant in commercial products. Muntries chutney is now sold at Coles supermarkets, part of the range of indigenous food products that has generated over half a million dollars in sales in its first year on the market (Watson I, 2002). Some suggest the company never actually undertook genuine plant breeding but simply submitted an ‘original’ version of the plant (HSCA 1998). It is interesting to note that according to IP Australia’s database the application for Plant Breeders Right of the Muntries was withdrawn in September 2004. In Australia there are a number of books which have been compiled to record the ethnobotanical medical knowledge of Aboriginal peoples. 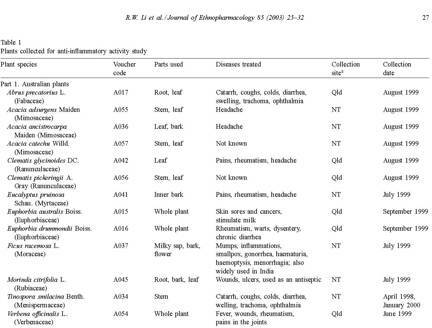 The sample table below lists a range of plant material collected for analysis and the traditional Aboriginal medicinal uses associated with the plants. There are many other examples of Australian Indigenous medical knowledge reflected in scientific research that cannot be necessarily linked as specific examples of bioprospecting. Sometimes there is a genuine parallel and separate research 'discovery' that coincidentally was already known to Indigenous people. For example there are patents pending on powerful anti-biotic compounds secreted by the metapleural gland of the Australian Bull Ant. This was a recent discovery by Australian scientists. However, Aboriginal Australians have known about the anti-biotic property of this Bull Ant secretion for generations (Beattie 2001). Professor Andrew Beattie related to the author how an Aboriginal woman in Central Australia heard an interview of his on the radio about the anti-biotic properties of the Bull-Ant and phoned him with excitement to confirm her mother used to treat her and her siblings. She described a process where they would stir up a Bull Ant nest, wrap a cloth around a stick, push the cloth into the nest until it was covered with ants, pull it out and shake off the ants, and then bind a wound so that it would not become infected in the hot desert sun. She was excited because the radio interview confirmed the knowledge of her mother and ancestors about the antibiotic properties of the ant secretions used for generations by her community. Indigenous medical knowledge (IMK) requires protection within a number of legal regimes for such protection to be effective. These include environmental law, intellectual property law, human rights law and an increased capacity for self-determination through a more comprehensive recognition of native title and accompanying land rights. Nationally uniform legislation that positively and directly protects IMK in Australia does not exist. There are a number of inhibiting factors to overcome for this to change, while equally there are positive signs that such a capacity is developing. In May 1994 Australia established a Commonwealth State Working Group on Access to Biological Resources to investigate options for a national approach to access to biological resources in Australia. The goal of the Working Group was to identify the benefits of a national approach for the Australian community, to develop principles to be applied in the assessment of mechanisms and in negotiations concerning the grant of access, and to develop mechanisms that may be employed to govern the access to and the collection, processing, development and export of Australia’s biological resources. The Working Group then produced a draft discussion paper which considers arrangements for managing access to Australia’s biological resources, and proposes a nationally consistent approach (Hassemer 2004). This national policy is the clearest commitment in Australia to principles of the CBD, including equitable access and benefit sharing, mutually agreed to terms and prerequisite consultation processes with indigenous communities. However such positive policy shifts have yet to demonstrate effectiveness in influencing relevant legislation or related Native Title issues. An NCA that is "positive" means everything to everyone, like motherhood and apple pie. I regret to say that some aspects of the current NCA discussions are actually retrograde rather than positive. Anything that forces a Western cultural norm on indigenous people against their will, requires careful examination. Forcing a "One-size-fits-all" Western cultural norm is now the policy norm, supported by a societal mood that is less tolerant of differences than 20 years ago. Policy directions also favour immediate individual benefits rather than stored/reserved communal benefits. Even lumping all indigenous people across this continent together is a potentially false premise. It is like saying the requirements of the Saami of Finland are the same as for the Turks in Edirne (a comparable range of cultures in a comparable sized continent). Another classic fallacy is to equate the situation of tribal indigenous people with those that have suffered "de-tribalisation" (similar to confusing Afro-americans with other black Africans, leading to the current situation in Liberia). The former tend to prefer collective benefits while the latter are now calling for personal returns on royalties, with the associated arguments about distribution between individuals, families and tribal groups. I am also wary of highly educated, vocal individuals representing the silent and even confused majority. The former are all influenced by their personal, often regional, experience and quite often biased (either for or against certain issues) by their Western education. To me the degree of "lumpability" (aggregation of indigenous concerns) is proportional to the level of abstraction up the hierarchy of issues - the higher the abstraction the more relevant an NCA is, e.g. principles of equity and access to resource benefits can be agreed as an NCA but how it is applied in Central NSW and Arhemland may be entirely different. The only sure principles [are] where every individual matters (with their own specific requirements), ever community matters (with its own local, environmental requirements) and people matters (with their culturally-specific requirements). The Convention on Biological Diversity has established a national reporting process to monitor nation states implementation of the CBD principles. In late 2005, the Australian Government released its third report to the Convention on Biological Diversity (DEH 2005). While in that report there is a series of mandatory questions. As is more fully explored below, the Biodiscovery Act 2004 (QLD) is perhaps the most notoriously cited example of ignoring indigenous rights or obligations to international agreements such as the CBD, particularly regarding such issues as equitable benefit sharing. The drafters of the bill originally included reference to a questionable level of benefit sharing with Australian Indigenous peoples, but withdrew any reference at all prior to it being accepted as legislation. In that context, for it to be offered as an example of Australia fulfilling its CBD obligations, particularly in the context of ‘prior informed consent’ and ‘mutually agreed to terms’ with indigenous peoples brings into question the actual effectiveness of the NCA in effecting positive change in actual legislation. [I] applied to join PBRAC as an individual interested in helping indigenous communities to domesticate Bush Tucker and to protect their cultivars. I was then appointed as the member representing indigenous interests. As I did not have the support of indigenous communities or any official mandate to do this, I was somewhat concerned about this and insisted on an amendment of the minutes of the first committee meeting that I attended, to clarify my position. (Personal communication between Roger Leakey and Natalia D'Morias, October 2005, cited with his permission and on file with author). As of 27 March, 2006, IP Australia’s website still lists Professor Leakey as the ‘Member Representing Indigenous Interests’. Intellectual Property Law as it stands now within Australia has generally not developed out of consultative frameworks of policy or principles that rely upon the positive resources of international conventions. (Such as the CBD, ILO 169, Human Rights Conventions, the UNESCO Convention of Cultural Property, Ramsar Convention on Wetlands, CITES and the Convention to Combat Desertification.) The standard of policy development has been an ad hoc basis that has resulted in a less than satisfactory context, particularly in regards to the protection of Indigenous Knowledge and the potential implementation of appropriate national standards. There is a clear danger of developing IP for the protection of indigenous knowledge upon such an ad hoc basis, rather than upon a consultation process that results in commonly agreed principals that should form the basis and guide the goals of such IP development. The danger is that such a context correspondingly results in an uncoordinated application of protocols of access to indigenous knowledge that will vary in their level of ethical standards. More specific limitations of IP in protection IMK will be discussed later in the chapter. [T]he said Indians and all other people who may later be discovered by Christians, are by no means to be deprived of their liberty or the possession of their property. The 1832 decision of Johnson formed the foundation of jurisprudence in New Zealand and Canada, while the Privy Council has long acknowledged its authority. Only since the 1992 High Court decision of Mabo (Mabo v Queensland (No 2) (1992) 175 CLR 1) has the Common law principle of Native Title been recognised. Yet the form that Native Title has taken thus far is very limited in its scope in comparison with other common law countries. Since 1996, further exacerbating such minimal recognition of indigenous land rights, is the abandonment of Federal commitment to self-determination of indigenous peoples. This former official policy of self-determination has been replaced by a policy of 'self-management' in consultation with government agencies. Equally the policy of reconciliation that had gained such momentum until 1996 was abandoned and replaced with a policy of 'practical reconciliation'. This effectively focuses on equality and unity (which some have criticised as guises for assimilationism) but effectively ignores or minimilizes historical contexts of unique discrimination. Thus the creation of positive discrimination instruments for indigenous peoples through the creation of any special rights is no longer an option in such a policy. Due to this, the current political culture is not conducive to using current capacities within Australian law to create any special recognition of IMK. Generally, this context of ‘biopiracy’ is not symptomatic of an institutionally organised attempt at such appropriation nor any particularly conscious malicious intent. Rather it is primarily representative of a largely unregulated industry that has resulted in a number of parties seeking genetic resources from indigenous communities, whether directly or through accessing public knowledge, without reference to a much needed set of nationally standardised ethical guidelines that ensure appropriate IP protocol. While one is hopeful about the potential for the CBD and other positive international forms of soft law to offset the conditions that led to the endemic condition of biopiracy recognised in 2000, one can anticipate a time lag in the implementation of the development of such national policies on the local practical level where such appropriation continues to occur. This positive potential is also mitigated by the commercial interests of the nation in developing the bioprospecting industry, as seen in the recent parliamentary inquiry: Bioprospecting: Discoveries Changing the Future, (Inquiry into development of high technology industries in regional Australia based on bioprospecting), August 2001. This document offsets CBD concerns by emphasising the need to attract investment by reducing any appearance of restrictive protocol or benefit sharing ‘barriers’. Section 3.49 acknowledges that no provisions exist for benefit sharing arising from use of resources. Current government interest is primarily upon the facilitation of the biotechnology sector in order to potentially achieve rapid economic growth. This is accompanied by both a national campaign to develop biotechnology infrastructure, as well as aggressive international marketing campaigns designed to attract multi-national interest in investment. Protection of the environment is seen as necessary to the degree that it facilitates this commercial activity. Ensuring correct protocol with indigenous communities is seen as necessary to the degree that it facilitates the flow of commercially valuable knowledge from indigenous communities to the bioprospecting sector. Yet even this minimalist economic instrumental approach is undervalued when legislation such as the Biodiscovery Act 2004 (QLD) is brought to the table with no mention of appropriate indigenous protocols or benefit sharing. However, even from a purely economic instrumental approach, there are good regulatory arguments for reform that have not seen much discussion in Australia. For example on the purely economic side of intellectual property and incentive theory, there are at least two incentives to having special (sui generis) protection for Indigenous intellectual property. 2) the incentive effect to keep the knowledge pool in its entirety (Sempath 2005). A full and frank consultation about these regulatory principles would possibly be fruitful, however anything less than a wide ranging and public consultation process can prove to not only be ineffective but possibly harmful. For example, John Henry Vogel examines the Queensland Biodiscovery Policy Discussion Paper (Queensland Government 2002), [where] the word “biopropsecting” has been replaced with the seemingly less odious term “biodiscovery.” (Vogel 2005) Among various criticisms of this discussion paper Vogel examines is the effective benefit sharing equation 0.003 or 0.3% on offer. While this is considered unreasonably inequitable in light of the CBD, it also only applies to landowners upon whose land a 'biodiscovery' is made, which removes indigenous people from such considerations of benefit sharing even further. Of great significance is that the disclosure by Vogel of this ‘backfired’ and the Queensland Government ended up removing altogether any reference to benefit sharing with indigenous peoples rather than reform the policy to meet the growing international standards (Vogel 2006). There has been an explosion of biotech companies formed in Australia in the past five years. In 2002 there were only about 180 biotech companies while by 2004 there were over 400. An increasing share of them are dedicated to human therapeutics, the biotech field that includes the bioprospecting industry, with a growth from 43% of the biotech sector to 46% in February 2005 (DITR 2005). Nearly all of them are small to medium sized companies. Those companies specialised in bioprospecting are focused on the screening of flora and fauna for bioactive compounds. However they generally do not continue to the final commercial stages of product development, marketing and sales to the public. Once the isolation of the bioactive compounds has been completed, the rights are sold to multi-national pharmaceutical companies, usually based in the U.S.. Thus, although there is a national intention to facilitate the biotechnology sector for its development as a significant economic resource base of the country, in reality the current state of affairs is enhancing the flow of genetic resources from the “South to the North”, making fulfilment of the nations concern for truly long-term sustainable development practices on a national level very problematic. Due to the current awareness of economic loss associated with benefit sharing and the potential undesired complexities associated with indigenous protocol issues, bioprospecting companies in general prefer to develop and rely upon existing ex situ databases that do not impose such requirements. As indigenous knowledge that has already been appropriated by such pre CBD ex situ collections is not protected, this also makes it expedient as a valuable resource. 80% of all companies that use ethnobotanical knowledge...rely solely on literature and databases as their primary source for this information. This fact has significant implications for benefit-sharing, and suggests that academic publication and transmission of knowledge into databases - rather than filed collections on behalf of companies - are the most common route by which traditional knowledge travels from a community to the commercial laboratory. Companies therefore have access to knowledge in ways that do not trigger benefit-sharing (ten Kate 1999). It is also suggested that a significant amount of undisclosed direct in situ appropriation of indigenous knowledge is occurring in Australia. This assumption is justified for a number of reasons. The first reason has already been mentioned, that of the year 2000 RAFI “Captain Hook” award for the greatest level of biopiracy of any country. This assumption is also due to the awareness of the cost savings associated with bypassing much of the pre-screening processes associated with more random methods. Currently there is little recourse for indigenous communities and without well-designed pre-screening contracts, no penalties for unethical appropriation are imposed upon corporate appropriation. The assumption of continued ‘black market’ bioprospecting is further reinforced by the examination of the statements of randomly selected bioprospecting company policies, quarterly shareholder reports and annual reports which usually fail to mention any indigenous participation whatsoever. Given that previous analyses has shown that 77% of the bioprospecting of plant-related pharmaceuticals finds its origin in indigenous communities, it is contrary to common sense to assume that such a pattern has altogether ceased. There is a growing consensus among indigenous communities that IP as it currently exists in Australia does not sufficiently provide effective protection for indigenous knowledge. As such one can anticipate that in situ bioprospecting activities involving indigenous communities will slow in coming years until indigenous confidence in the effective capacity of IP is restored. The next section of the chapter addresses some of the background concerns of indigenous people, the nature of indigenous knowledge, and suggests ways forward in the long term process of determining how it can be protected in order for relationships of trust to be justifiably developed. It should be first stated that this by no means represents a comprehensive overview of indigenous concerns. Rather it is an attempt to take a step back, allow a wider vision of context, and then discuss select concerns that are considered under-represented in the IP debate. This is offered as resource for addressing more fundamental long-term issues of IP, but are considered no less important than many of the necessary and immediate attempts of remedy involving more specific technical discussions. First it is important to recognise something that seems like common sense but that occurs remarkably frequently in our history. It is that we should avoid objectifying the thousands of unique indigenous communities or their knowledge systems as monolithic singularities whose nature can be simply categorised into neat definitions. Due to the great diversity of contexts that indigenous peoples experience, the qualities that comprise their community identity will vary widely. As well, their knowledge systems are equally diverse and are highly complex metaphysical networks of concepts that manifest themselves in a great variety of methodological applications suitable to the particular ecological contexts in which they dwell. In order to avoid such errors of simplification, misrepresentation and distortion of diverse identities and knowledge systems, it is suggested that development of appropriate IP laws is entirely dependent upon wide ranging consultation with such communities. This also implies the need for recognising the importance of indigenous self-determination in that it is they who are the experts in advising what is indigenous knowledge. All to often our laws have sought to inappropriately define what is indigenous identity and devalue and objectify their knowledge as superstitious and subjective tokens of a Neolithic age that merely represent “in situ” museums of a past age of human evolution. The centrality of considering self-determination in the formulation of appropriate IP to protect indigenous knowledge. If one is truly concerned with protecting Indigenous Knowledge, a successful resolution of intellectual property rights for Indigenous Peoples requires a shift of vision in the standard patterns of legal principals used in interpreting the relationships between Indigenous Knowledge and Bioprospecting. For the vast majority of Indigenous Peoples involved in this emerging discussion of TK and IP such a vision begins and ends with the rights of self-determination manifested in specific political contexts of struggle. An essential reason for recognising the basic right of self determination has already been discussed. Focusing on self-determination helps avoid the objectification process that often impairs the characteristics of legal regimes designed to ‘help’ them. The history in all countries in this regard is similar and no less so in Australia. At each historical step in the ‘evolution’ of legal regimes designed to help indigenous peoples, they have inevitably appeared barbarous and antithetical to ‘modern’ people. Even the legislation that forcibly removed indigenous children from their families for assimilation purposes was designed by those who thought they had the best interests of those children in mind. We should not sit back and confidently judge such epochs as representative of contexts we have moved beyond. We may have apparently moved beyond them due to certain types of maturation in community consciousness. However the methodology of objectification that is still employed will ensure that future generations will judge current legal regimes designed to help indigenous people, no matter how laudable the present generation believes them to be, as equally inappropriate in nature as previous ‘barbaric’ regimes. Focusing on self-determination and genuine consultation processes discourages the repetition of such a history. There are a growing number of western legal scholars who do acknowledge the centrality of self-determination in such a discussion. However the inclusion, much less the centrality of such a concept in standard IP papers focusing on TK is less than common. It is safe to say that if it is acknowledged it is because of ethical considerations that compel a considered response to indigenous concerns, rather than representing a natural emanation of apriori inner orientation among western legal scholars. The key to transforming the currently relegated status of self-determination in IP is to convey its importance in standard legal education programs which facilitates a more natural and sincere consideration by future legal scholars. One of the hallmarks of ignoring self-determination is that the typical focus in protecting TK is really upon protecting the valuable commercial products that result from such knowledge, rather than upon the unique value of the process of TK itself and the indigenous communities that represent the foundation of such knowledge. The first focus is upon economic commodities, the second is upon the relationships that result in such economic value. On an environmental parallel, it is as if the discussion is upon protecting the rights of individuals to the resources of the earth as opposed to protecting the ecological relationships that produce such resources in the first place. A serious commitment to ecologically sustainable development requires a shift of vision to the latter, which in the context of TK and IP requires acknowledging the centrality of self-determination. Dealing with the limitations of IP law in protecting indigenous knowledge: Is a paradigm shift in IP law impending? [Spiritual knowledge] is probably the least protected and explored by the Western legal regimes, although its significance and interrelatedness with the other two categories [physical and artistic] is striking. ...the development towards a satisfying protection of indigenous interests in ethnobiological knowledge heavily builds upon the outcome of the evaluation of the nature and intrinsic value of ethnobiological knowledge. ...extensive research on ethnobiological knowledge will have an important task in the preparatory phase for the adoption of sui generis legislative protection (Koning 1999). Additionally, although there may be indigenous appreciations of proprietary interests in property, it is fundamentally seen as a spiritual bequest from the ancestors (Langton 2005). Intellectual property is therefore primarily a spiritual gift from the spiritual realm and carries with it obligations of respecting and recognising the ancestors who gave it to us. On the level of the system of global IP regulation there are also significant structural limitations. Adam Smith is credited with contributing the influential ‘invisible hand mechanism’ theory associated with enlightened self-interest which provides important reasons for relying on property rights and markets. Basically he suggests that pursuit of the individual good in markets will benefit the public good. Drahos, however, suggests that once ‘property rights take the form of privileges in abstract objects the invisible hand mechanism may cease to be a reliable guide to the collective good’ (Drahos 1996:139)’ This is partly because of the increasing ability of powerful factions to manipulate the regulation of IP out of opportunistic self-interests. So the very system itself is altered to serve their individual interests. This power increases as the scope and strength of IP laws increase. Because of the more abstract nature of this property the full dimensions of this manipulation and cost to society is not yet fully realized. Returning to the contemporary western model of IP law, the proprietary model of rights based focus arguably present a number of weaknesses. These include but are not limited to various forms of individualism, anthropocentrism and an instrumentally materialistic rather than intrinsic or spiritually relational approach of ownership. The capacity for greed to influence legal development of IP is an extremely significant deficiency. Drahos commenting on Hegel indicates, “Civil society, once it comes to realize the pecuniary advantages of intellectual property rights, presses the state to build ever more elaborate intellectual property systems, systems which ultimately become a global system” (Drahos 1996:91). This described process is clearly present in the relationship between the strengthening and extension of IP through Free Trade Agreements which has been heavily influenced by the lobbying of political representatives with personal interests and powerful transnational companies in Washington (Drahos & Braithwaite 2000, 2002). The international instrument which has the greatest influence on regulating IP relationships is TRIPS, yet an incredibly small group of influential people devised its creation. When combined with increasingly comprehensive sets of intellectual property rights in regards to abstract objects in a global system this produces relations of separation, fragmentation of community, restricts freedom and locks up knowledge previously held as the commons (Akerlof 2002). In the current framework, the diversity of indigenous customary legal frameworks are increasingly being rendered powerless to apply the legal principles they consider important in protecting their own traditional medical knowledge. Additionally, in such a global regulatory context the current climate of increasing the strength of intellectual property and the range of subject matter that can be considered property (e.g. recently expanded to include human genetic information and living organisms) encourages opportunism in the appropriation of the commons by individuals and corporations as well as diminishing the remaining sense of the sacredness of life as we begin the path of even commercializing ourselves. Another important criticism of both real and intellectual property is the abstraction, externalization and alienation of people divorced from the various forms of property including land and the mental and spiritual creativity of the individual and community. One aspect of this divorce is seen in the false dichotomy of the protection of the expression of ideas rather than the ideas themselves. Only when they are reproduced in a material form in a particular manner are ideas protected in copyright for example. The individualistic and dichotomous aspects of intellectual property also diminish the recognition of creativity as a form of relationship between the individual, community and inherited common traditions, a concept sometimes referred to as holistic individualism (Pettit 1996). Marx offers a strong criticism that the ism of commodities in a framework of capitalistic economics separates intellectual property from the reality of social relations upon which it is actually based (Marx 1992). This allows for the peril of ignoring the negative effects of an overly materialistic/capitalistic system of intellectual property in the social fragmentation of humanity. This fragmentation largely occurs through the fostering of extremes of wealth and poverty through the increasing appropriation of the commons by those in power. This is reflected in a significant pattern of economic disparities mirrored in the standard feminist and indigenous critiques of socially unjust objectification of a hierarchy of relationships. These increasing extremes of wealth and poverty find their greatest contrasts between developed and developing countries, sometimes generalized as the ‘north-south’ divide enhanced by the location of multinationals in the ‘North’. Even more telling, for the purposes of this chapter, these extremes of wealth and poverty can be seen between white and black, male and female or more specifically the dominant Western culture and Indigenous cultures. This does not necessarily prove that intellectual property law is sexist or racist itself, although there are those who argue that it is (Warren M. 1992, Mgbeoji 2006). One can see statements by indigenous peoples that IP represents “a new form of colonization" and "a tactic by the industrialized countries of the North to confuse and to divert the struggle of indigenous peoples from their rights to land and resources on, above, and under it.” (Cited in Posey & Dutfield 1996:211-212) At the very least however this context of the disparities of wealth and poverty, and the manner in which IP regulation contributes to this, indicates that the current legal cultural framework allows for an instrumental use of intellectual property that permits its use as a tool that can support racist, sexist and nationalist ideologies to reinforce these disparities of economic injustice from the local to the global level. Drahos and others suggest that we must ask what is the moral theory and set of values associated with intellectual property usage. IP law should be linked with a strongly articulated conception of public purpose and role of IP. ‘Legislative experiments with these rights would be driven by information about their real-world costs and abuses’ (Drahos 1996:224). This reinforces the need for a framework which enables the diversity of cultural and spiritual traditions a voice in consulting about the set of values considered appropriate for their local contexts as well enriching the global framework. This should be combined with empirical economic, social and scientific measurement mechanisms that confirm projected and actual social effects of the implementation of such moral theories in IP. Some of the corresponding limitations in IP are reflected in its inability to accommodate the true sophistication of the dynamics of the interface and synergy between biocultural diversity and globalization. This represents the greatest challenge to a largely homogenous IP system that plays a significant destructive role for both cultural and biological diversity (Mgbeoji 2006). This chapter suggests that beginning a more conscious engagement with the spiritual dimensions of indigenous customary law offers powerful catalysts for empowering the paradigm shift required. Thus IP regulation that involves a focus on consultation processes with local communities (not just the international representative level) is considered essential. Reference is made again to the considerations related to avoiding the simplification, caricature or objectification of the nature of indigenous knowledge. The imperative for recognising diversity and sophistication in indigenous knowledge systems imposes the already mentioned responsibilities of establishing the primacy of consultative frameworks with indigenous peoples and the essential recognition of self-determination. Additionally such consideration imposes the responsibility to adopt flexible measures of protection capable of responding to the varying values such diverse and sophisticated knowledge systems represent. It is suggested that there are three levels of value that need to be addressed if a long-term solution to IP that adequately addresses the needs and concerns of indigenous people is to occur. The first level of value is the instrumental economic value of indigenous “products” that are appropriated in the bioprospecting process. That is the level at which most IP discussions take place. The next level is the value of the unique indigenous knowledge methodologies, metaphysical frameworks and epistemic foundations that are responsible for the ‘production’ of these commercially valuable products in the first place. The third level of value is the intrinsic value of the indigenous people themselves and the web of spiritual, social and ecological relationships which their identity is intimately associated with. 1. Short term to medium term- e.g. adoption of Prior Informed Consent frameworks such as WIPO’s formulation of “The Requirement” (Carvalho 2000), access-restricted indigenous owned databases (Dutfield 1999), ‘multi-first-nation’ indigenous owned pharmaceutical companies (Jones 2006). 2. Medium term- e.g. sui generis integration of human rights (Posey & Dutfield 1996), linguistic human rights (Skutnabb-Kangas 2000, Maffi 2001), international environmental law and intellectual property. 3. Long term - ongoing consultation process on reviving capacity of law to value variety of spiritual consideration of indigenous peoples based on the development of tools of historical and metaphysical empowerment. This ultimately translates into a capacity of law to facilitate indigenous self-determination through being able to involve and acknowledge the validity of the diversity of intellectual property found in indigenous customary legal systems. It is suggested that this last issue of understanding and protecting spiritual knowledge is the key integrative principle for understanding many of the problematic IP issues mentioned earlier. It is also unfortunately, the least discussed and understood issue in the IP debate. The next section explores the issues associated with developing the fundamental resource for IP of understanding indigenous spiritual knowledge in western legal traditions. From a traditional Aboriginal perspective, traditional knowledge was and is given to the people from the Dreamtime or spiritual world. Knowledge connects humans and all other living things through its source. The source of all traditional knowledge is derived from our spiritual interaction with each other, the Great Creator, creator beings and the spirits known as the ‘Dreamtime’ (Willis, 1950). The establishment of human roles and responsibilities is derived from kinship. Kinship is a term that relates to the way Aboriginal people traditionally interact with one another. From a traditional perspective, all living things are related through the Dreaming and the totem system. People were classed through a totem system that connected community into extended family relationships. Even people that were not necessarily related by blood ties could be related through the traditional kinship system. The expectations and obligations instilled by the Aboriginal kinship systems still influence contemporary Aboriginal relationships. It is these relationships that bring together extended families in communities (Sim, 2003). Traditional kinship systems were believed to be given to the people through the Dreamtime and enforced by traditional law. Reciprocal obligations and expectations are connected to spiritual and religious relationship to spirits, the spirit world, humans and other living things. Today, roles and reciprocal responsibilities are being continuously eroded by the imposition of western society, assimilation and integration. However, those people who are custodians of traditional knowledge predominately follow the ‘rules’ set out by religious tradition to pass on and retain traditional knowledge. Breaches of those ‘rules’ degrade and erode the framework in which traditional knowledge is passed on, resulting in a loss of knowledge to those in the physical world. Elders are expected to pass on knowledge in the same manner as it was taught, the role of an ‘elder’ or ‘teacher’ is governed by religious expectations or ‘rules’(Willis 1950). The establishment and affirmation of a sense of community is established through kinship and country. Different tribes are geographically related to different parts of Australia. The understanding of a specific community will dictate who is included within any specific tribal group. Knowledge is connected to ‘country’ in a spiritual way. A person’s connection to ‘country’ and ‘community’, as well as their kinship relationships through totems, gives them the ability to access, use and pass on traditional knowledge. Country is understood to be someone’s homeland. A homeland is a place or area in which a person or group of people have a spiritual connection and a genealogical history (Bird Rose, 1984). When the people of a community use traditional knowledge in a culturally accepted manner, they do it for the benefit of the community and the country. If the community is ‘sick’ (physically or spiritually), the country becomes ‘sick’ (ecologically). If the country becomes ‘sick’ the people become ‘sick’ (physically or spiritually). So, there is a special relationship or balance that is kept in check by the ‘good’ use of traditional knowledge and the interaction of spiritual and the physical forces. The use and understanding of traditional knowledge is influenced by gender. Knowledge is passed on and used in gender specific ways that relate equally to the roles of men and women. The division of knowledge into gender related categories is influenced by religious rules from the Dreamtime. These formal ‘rules’ or customary laws specifically relate to how men and woman have the right to access and carry certain knowledge, visit certain places and participate in ceremonies (Berndt and Berndt,1992). There are protocols that are derived from the Dreamtime that influence people in all facets of their lives. The maintenance and passage of knowledge throughout the community and the forthcoming generations is influenced by these protocols. The loss and erosion of these protocols hinder the maintenance of knowledge. These protocols are underpinned by respect for the natural world, the spiritual world and for human kind as a part of the ‘living’ world (spiritual and physical). From a traditional Aboriginal worldview there is a notion that knowledge has an animate nature, due to the characteristic way it is carried and passed on from the spirit world into the physical realm and back again. ‘What comes from the earth can return to the earth, what is given can be taken back, what is lost can be found’ (Skuthorpe, 1995). This last point emphasizes the nature of traditional knowledge being something that is carried not owned, being a gift given for the benefit of the ‘whole’ community (human and non human) to be used in a very specific way dictated by the definition of respect forged by the framework established by Aboriginal religious knowledge (Dreamtime) and spirituality passed on via the spirit world. If traditional knowledge is not respected it will be returned to the spirit world until it can be received by those who will carry it in the appropriate way (Willis, 1950). Therefore, knowledge will be lost if it is not respected, it is respected by understanding (learning/observing) the appropriate cultural protocols (actions/impacts). These protocols are not strictly confined to the observance of respect within the human community but also to the Aboriginal world as seen through Aboriginal eyes (The spirit world, the physical world, all other living things) as they are inextricably connected via creation. A number of factors greatly impair the capacity of Western IP law to understand and protect indigenous spiritual knowledge. Understanding these factors is essential in the development of a long-term comprehensive discourse about the nature of indigenous spiritual knowledge and how it is best protected. The following introduction to the subject intentionally simplifies and generalizes the nature of western culture in order to make clear a particular observation about a common perceptual incapacity, due significantly to such an objectification in varying degrees. Effective vision sometimes requires new glasses, the removal of cataracts from the eyes, or even a retraining of the mental capacity to process vision. Sometimes blindness s up on us so imperceptibly, that our impairment is not recognized until we are specifically tested or diagnosed. On a cultural level, if the incremental nature of such impairment is extended over generations, then the chance of recognizing the impairment is further reduced. In some ways, in attempting to define and protect indigenous spiritual knowledge Western observers are squinting at a multi-dimensional object trying to make a judgment call that is made impossible by an impairment, or rather a lack of perceptual skills and training that we do not even anticipate needing to acquire. Social scientists have provided useful models that explore how there are types of social training involved in developing the visual skills to perceive different types of multi-dimensional objects which may be comprised of complex relationships. A useful and simple way of appreciating this is the popular stereogram ‘magic eye’ composite images which ‘activate’ if we hold the image at a close range and very slightly cross our eyes, a 3-D image ‘pops out’ of the original two dimensional picture. But without the knowledge to anticipate that the ‘pop out’ exists or the visual training that is required, it is unlikely we would ever know of the extra dimension of the image. (For a related use of this analogy, see Pettit, Forthcoming 2007). The same is true for a sheet of musical notes. A trained musician will look at the piece of paper, and ‘hear’ sophisticated music in her mind and be able to reproduce that with an instrument. However, a person not so culturally trained in music would not have any way of naturally anticipating that the marks on the paper actually represent music. A conversation might ensue where a musician may show someone a sheet with Mozart’s greatest music upon it, yet the person unfamiliar with what music is and not aware of the training required may very well say, “This person is mad. Music does not exist. I cannot hear it when I look at that paper.” It is suggested these are reasonable analogies for our cultural capacity to perceive metaphysical categories, such as particular spiritual relationships. It is as if a person of Western background sees an Aboriginal painting and is willing to concede the aesthetic qualities of the art, but will claim that the spiritual ‘song’ of relationships the painting describes are a superstition. He possesses neither the training, nor the knowledge to anticipate the ‘pop out’ of a third dimension which such training would enable. This touches upon a level of practical relevance for IP discussions. Aboriginal artwork, including paintings, are not just aesthetic expressions of spiritual or ecological relationships and they are not just ritual expressions honouring the ancestors and the dreamtime. On another level, besides honouring the spiritual source of the intellectual property received from the ancestors they also often contain scientific statements about their medicinal knowledge, commonly containing stories related to the epidemiology of the diseases associated with the medicines. The painting presented at this conference, the Bumble Tree, is a clear example of a detailed recording of differing types of medicinal knowledge associated with the tree. The Western perceptual challenge to perceive the extra dimensions of the ‘objects’ of indigenous knowledge is thus affected through lack of anticipation, or faith in the expected ‘pop-out’, inadequate visual training enhanced by linguistic categories that naturally filter relationships into categories of objects which render the multi-dimensional nature of such knowledge effectively into two-dimensional categories. While those challenges are significant enough, they are not insurmountable as appropriate processes of education can create the anticipation; provide the training and shift the focus from object to relational categories necessary to more fully appreciate the multi-dimensional aspects of indigenous knowledge systems. the practical effect of databases of indigenous knowledge must be to flatten precisely that diversity of knowledge supposed to be characteristic of indigenous forms. It is suggested that both the instrumental nature of IP and such database collections similarly represent inappropriate mechanisms of knowledge filtration that seriously distort the representation of indigenous knowledge itself. The IP academic debates have reduced a sophisticated network of indigenous spiritual kinship relations that intimately link land, community and ancestors, known as ‘traditional knowledge’ or “TK”, into a round peg and then try to fit that peg into a square hole of ‘scientific and economic reality’. Being astute observers the legal experts declare the round peg does not fit their standard square hole. It is now announced that they need a new sui generis ‘round hole’ to fix the problem. They then convene hundreds of international conferences of experts and form international institutions to manage the endless debate on the dimensions of the round hole required. They then focus on whether an international system can be developed to systematically produce round holes that are flexible enough so they can be applied universally to every indigenous community. They write thousands of papers and books to address this problem, making a good living from it and are promoted within their departments as they manage to publish their findings. It is believed that inevitably, the manufacture of such round holed definitions of indigenous subject matter will be successfully developed and mass produced for export to the world’s legal systems (where it will at last become recognized as one universal system); whereupon the western legal community can relieve itself of this distraction and the capitalist community can get back to the business of business as usual. Meanwhile, one asks, “who is sitting down with the local communities affected and listening to their yearnings and aspirations to preserve the lives and social integrity of the very communities which develop and carry the sacred knowledge in the first place”? There is more to this IP challenge than technically determining how flexible a two dimensional hole has to be to encompass a third and fourth dimension. In order to address this need for this deep level of ‘training’ and corresponding instrumental creativity in our own western cultures, we have to start with humility. This is an acceptance of “I don’t know”, rather than beginning with the more common feeling of ‘informed scepticism’. We can’t start with “I am willing to believe you if you prove me wrong first.” Such humility precipitates and catalyses paradigm shifts. Historically scientists acknowledged the limitations of their vision. “We know there must be invisible things in the world we cannot see due to spectrums of light, frequencies of sound and the size of objects”. Through such humility they were enabled to develop tools of investigation such as the microscope, telescope, radioscope and many other instruments that revealed new previously unimagined layers of reality. In this new discourse, by embracing such humility about spiritual issues as well, we are offered the chance to develop new tools for seeing the spiritual truths of many cultures and a hidden dimension of our own as well. Such impairment in western culture has occurred first by the willful devaluation and closing of one eye and the subsequent general deterioration of vision that has occurred through neglect. To clarify: many indigenous peoples consider that spiritual and material reality forms a unity. To deny one to the other is to completely lose a dimension in our vision. The balanced, coordinated use of both eyes is required to enable the shift from two dimensional perception to three dimensional vision. Such two dimensional vision impairs our capacity to recognize the depth of relationship and perspective between objects which is fundamental to the relational quality of indigenous spiritual knowledge. Western culture has experienced such an unnoticed gradual impairment of ‘metaphysical vision’, most significantly in the period since the Enlightenment, that particularly relates to the incapacity of IP to adequately relate to indigenous spiritual knowledge. The discipline of law is generally not well designed to conduct such an examination. However, it is only by adequately diagnosing the mechanisms of such impairment in the history of the formulation of our legal system that we are enabled to formulate potentially appropriate remedies. In order to engage such a diagnosis of mechanisms other disciplines must be called upon in order to provide law with the resources necessary to construct such adequate remedies. Among the necessary disciplines are included legal anthropology, ethnobiology, historical criticism, sociology, comparative religion, and scientific philosophy among others. This chapter hopes to demonstrate the need and value of such collaboration in the long-term process, so those members of the discipline of law are encouraged to invite these other disciplines into a specific collaborative projects of consultation and diagnosis. Indigenous people must be included in this consultation process and the diversity of customary IP norms respected and empowered to participate in the global flow of legal development. * interpret unfamiliar religious forms through the framework of possibly inappropriate familiar forms. Regardless of the response, a further feature of a highly secularised society is likely to be unease and imprecision in the use of terms which refer to the religious elements of a tradition. The tendency in both legislation and commentary referring to Indigenous heritage has been to use the terms 'the spiritual' (or, occasionally, 'spirituality'), 'the sacred', 'custom', 'culture' and 'tradition' somewhat interchangeably. Such imprecision goes hand in hand with a reluctance to define 'spiritual' or 'sacred'. Yet the meanings which are implicitly ascribed to these concepts may have substantial consequences for the ways in which claims are resolved. In particular, the common usage of 'spiritual' inappropriately implies, for Anglo-Australian readers, a realm opposed to, and superior to, the 'material'. It is suggested that IP law is particularly afflicted with this ‘deep seated secularism’ that tends to objectify, devalue, distort and ignore particular elements of indigenous spiritual knowledge that are unfamiliar both in form and orientation. In order to repair such vision the following discussion of the origins of such a process is offered. From our own point of view, a central feature of culture is that it is the social manifestation of unique sets of spiritual virtues formed in the long-term relationship between a specific community and the ecological context in which they exist. In other words, our relationship with the land in which we dwell forms our culture. This is a relational understanding of culture that has been largely lost in the west. In western theories, often culture is seen as the subjective experience of collections of individuals, and therefore the value of such culture is objectified as the domain of personal opinion. The value of culture is therefore degraded to having no real value in itself other than it’s aesthetic value, as if it were a piece of artwork that can be bought, sold, or destroyed if its value is not recognised. The imbalanced and fractured perspective of culture and civilisation, spirit and matter in western consciousness can be traced historically back to the enlightenment period in which European philosophers, politicians and scientists developed what has often been called a dualistic metaphysics or world-view (Bordo 1987). This period has often been caricatured as a war between science and religion, with science the ultimate victor. However this fracturing of metaphysics is due to a somewhat more complex history (Nebelsick 1981). Such a fractured worldview was the product of over-reactions to the tyranny of knowledge enforced by both political and religious leaders at the time. Such tyrannical assertions of absolute truth resulted in such great injustices as the thirty-year war and the grand inquisition. The philosophies and political reactions to this injustice that were largely perpetuated by religious institutions, resulted in the removal of the “tyrant God” from the centre of modern thought. This process of the removal of the Divine was gradual but effective. Ironically most of the central figures considered responsible for this process all believed in God, and some of them quite strongly. For example Descartes who has been often vilified for having contributed many of the more dualistic and materialistic elements of western culture believed he was justifying God. Newton had more books on theology than science in his library and considered his treatise on a book in the Bible as his greatest work (Forbes 1949). Yet the fashion in which many of these great thinkers were interpreted by radical secularists is largely to be blamed for the fracturing effect (Mcgrath 1999). The ‘Galileo Affair’ was one such story popularly interpreted as closed minded religion vs. open minded science, yet Galileo himself was a strongly religious person (Gingerich 1982, Polkinghorne 1986). Such a summary does not properly represent the complexity of the historical and philosophical elements that contributed to such a process. But it may provide an adequately brief example of one of many valuable approaches towards examining the causes of our lack of capacity to recognise a unity of spiritual and material reality that is at the heart of many indigenous peoples concerns. Through the fracturing of metaphysics has the objectification of culture and nature become possible in western thought (Plumwood 1993, 2002). It is only possible to assert such theories as the patenting of life-forms or individual ownership of the land when one divorces human existence from nature, so that one may possess it as if it were a dividable commodity and not an interdependent web of relationships. This is why many Indigenous people feel so uncomfortable being forced to answer the question imposed by the west “Which person can sell this land?” It is not an appropriate question to address their understanding of their unique communal relationship to the land and can only be asked by someone who has been afflicted by the spiritual neurosis inherited from the European enlightenment. It is like asking someone: “Do you own your mother? If you answer no, then I will own her.” In the Aboriginal Yolngu language, the term ‘Yothu-Yindi’ affectionately identifies the human relationship with the land as the same as the love between child and mother (Christie 1990:58). Law itself was subject to these processes of a splitting and fracturing of the spiritual and material in metaphysics and jurisprudence. Justifiably so, the dogma of religion and the associated trappings of power that can be abused were removed from the domain of law, however the benefits of spirituality and ethics, were impaired by this process. This has negatively impacted on our ability to appreciate the diverse forms of indigenous customary law where law and religion are not separate, and where spiritual and material issues of legal relationships are still integrated in varying degrees. Anthropologists have made strong advances in demonstrating that law and politics are not isolatable, and we are now reaching the understanding that religion and law are not separable. The morality of disputing processes is now everywhere heavily influenced by ideologies of a religious nature. Law and religion may have been officially separated in Western legal systems, but in former colonies of the Western world they are not. It follows that from these observations that a new range of questions will centre on contemporary disputing as an epiphenomenon of controlling processes that will continue to cycle into the next century (Nader 1990:322). Increased consultation processes with indigenous cultures where the spiritual and material has not experienced this separation to the same degree will partly contribute to the (re)training of metaphysical vision mentioned earlier. Lastly it is important to briefly explore further a “coincidence” that has been recently “discovered” in the west related to cultural knowledge. There is an increasingly acknowledged inextricable link between biodiversity and cultural diversity. The areas of the planet which are considered “megadiverse” in the levels of biodiversity are correspondingly megadiverse in Indigenous cultures. The majority of the worlds cultural biodiversity is representative of Indigenous populations. As previously mentioned, of the 6000 or so languages spoken on the planet, up to 5000 are Indigenous. Of these 5000 languages, nearly 2500 are under threat of immediate extinction with the current generation. Is this correlation between Indigenous diversity and biodiversity merely a “geographic” coincidence? This link is considered an ‘inextricable one’, which would lead one to think that the relationship is more substantial than coincidence. But Why? 1) Indigenous cultures conserve or enhance biological diversity. 2) Biological diversity directly enhances cultural diversity. 3) Large-scale social systems reduce both cultural and biological diversity. We must also return to the western metaphysics developed since the enlightenment that suffers from spiritual neurosis. Such is the western world view that nature is separated, objectified and denigrated as a commodity to be processed for consumption. To put it in a nutshell, western metaphysics treats the earth as a business in liquidation (Daly 1991). As this metaphysics of liquidation is by far the major power in the world, it has the most influence on human and environmental relations. Thus it is no coincidence that the planet is seeing the greatest rate of extinction since the dinosaurs (CBD/UNEP 2006), in terms of biodiversity, with similar rates of extinction occurring in indigenous culture (Skutnabb 2000 & Wurm 2001). Tragically, those cultures who have solutions to the environmental crisis embedded in their community life are being wiped out. Indigenous peoples thoroughly embody the principles of spiritual interdependence with their ecosystems, to the point where their self-identity IS their ecosystem. The significance of such self-identification is heightened when one reflects on the coincidence between the extinction of great numbers of ecosystems and the Indigenous cultures that are interwoven with them. Aboriginal people are not the only people to engage emotionally with their environment. What people become in their lifetime is a product of their engagement with the environment, constantly negotiating what they learn about themselves and the world. On a structural level of IP regulation there are two primary implications of spirituality: recognising the intrinsic value of interdependence and the unique intrinsic value of every individual component in that web of relationships. The relationships between the parts (local communities) and the whole (global community) result in an infinitely complex system that generates value in a unique way between every component part. A mistake is to assume the current IP regime is a universal system of value rather than a particular tool developed in a cultural context, albeit of the dominant culture. Attempting to overlay a ‘one size fits all’ IP norm, particularly one that is moving towards global regulatory models of stronger levels of exclusion and control, will increasingly face tensions as it fails to match the reality of diversity in human and ecological relationships and the many ways in which knowledge is generated and shared between communities. The structural implication is that we must consciously develop consultative mechanisms between cultures, in this case Western and indigenous customary legal communities on local as well as international levels. If such consultation processes are engaged in the right spirit, for example, beginning with humility and empowering the agency of each actor, this will enhance the synergetic flow of information and value between the local and global in IP regulation in order for knowledge generation, respect and protection to occur. Linked to enabling this spirit of consultation and purpose, as Drahos has suggested, we must also consciously attend to the other element of spirituality, the moral value system in which the IP instruments are used. This consultation process between cultures, religions and differing epistemic communities will also enhance the maturation of a conscious and effectively empowering set of moral principles. This has been generally left to a representational level at the international level of discourse. The more fundamental paradigm shifts of appreciation of beliefs in the ancestors and a spiritual dimension of existence will also be enhanced by such consultation processes. The culturally based visual training mentioned earlier for enabling the perception of 3 dimensional objects is an analogy of the capacity development that may occur through such heightened intercultural consultation processes. The scope of this paper has not allowed the exploration of practical solutions, yet it is hoped that it has provided resources of thought to empower unique processes of engagement between cultural understandings of IP that will result naturally in more effective solutions for each local community. To conclude however, some brief remarks are offered on unique models that arise upon taking seriously some of the spiritual concepts discussed. It is suggested that promoting the effective agency of indigenous communities is perhaps the best way of protecting the spiritual aspects of their IP. Upon attending the conference in Washington three years ago, we asked a number of people, “What about regionally based indigenous owned pharmaceutical/herbal remedy companies? What’s happening on that level?” The typical response was a moment of silence and exclamations of various kinds. Apparently the idea of facilitating actual full ownership by indigenous communities had not entered the normal legal discourse. It is suggested that metaphysically over the past decade or so, we have been stuck in an ‘us/them’ model of how to facilitate ‘benefit sharing’ in the international discourse. It is suggested that the idea of facilitating full indigenous ownership of their own medical knowledge arises when one takes the spiritual principles of interdependence seriously. If we are one family, it is a simple question of what do we want most for our brothers and sisters? It is beyond the reach of this paper to even begin to discuss this particular model, but there is a model of this occurring in Australia and another successful implementation of this has occurred in Bhutan. This model of genuine control and ownership is explored elsewhere (Jones 2006) but it is briefly mentioned here as an example of possible trends in paradigm shifts. The nature of what this ‘repatriation’ might look like and how it might practically be applied has not even begun to be discussed. Strong objections are anticipated, starting with people thinking it is primarily an economic rather than an ethical or spiritual issue. For example one study briefly mentions the issue of ethnobiological IP repatriation but suggests that with regards to knowledge already in the public domain, it is ‘doubtful’ that it ‘can be realistically ‘repatriated’ (Koning 1999:279). It is suggested that we start with merely reconnecting communities to the knowledge of healing that has been appropriated. Sometimes that knowledge has passed on with an Elder, or even if it hasn’t been lost it provides at least a moral and educational resource for their children and youth as a mechanism of improved self-esteem countering the discourse ‘you never invented the wheel’. In archaeology the repatriation of indigenous human remains evolved from a moral appreciation to a legal principle but it also initially met with strong objections yet evolved into a meaningful mechanism of reconciliation. Similar to experiences of enhanced reconciliation between archaeological and indigenous communities, it is suggested that developing a routine process of repatriation would strongly enhance this reconciliation process in IP relationships as well. A preliminary case study of the repatriation of the knowledge of a common cancer medicine (worth many millions of dollars) to an indigenous community is explored elsewhere (Jones 2006). The details are not described here as the community affected has not had a chance to fully consult on its response. However it is relevant to note that the cancer medicine had its name changed and the community was never aware it had been appropriated in the first place. While Global does not discuss universities specifically in these terms, it is suggested that the answer to the question is a clear “Yes. Universities are IP gatekeepers, perhaps the most significant IP gatekeepers of all between indigenous communities and transnational companies.” Why has this model that seems common sense not emerged in normative IP discussions? There are a range of reasons, but perhaps again it has something to do with a lack of consciousness of our human interdependence as well as an academic culture of developing the policy of other institutions, but not oneself. In Australia, this has an added dimension of importance when one considers that while Aboriginal communities are among the most colonised and socially affected peoples in the world, they are not eligible for the international funding and development programs made available to indigenous communities in developing countries. This places an added moral obligation on Australian universities to consciously explore what it means to be a development institution since their research has development consequences whether they are aware of it or not. Finally, this last question becomes linked as possibly the best context where the solution to the prior two questions can be answered. Universities are in the best position to engage in both repatriation of knowledge to their local communities, as well as beginning more active processes of capacity building towards long term projects possibly including indigenous owned pharmaceutical and herbal remedy companies. In closing we offer one last suggestion that is a response to the spiritual awareness of our interdependence as a human family and the unique intrinsic value and agency of indigenous communities. Universities should each establish research and policy centres in these areas, directed by indigenous peoples, strongly involving the participation of local indigenous community members, to engage the issues of ethically regulating ‘gatekeeping’, finding ways to engage the local customary law meaningfully, facilitate capacity building and meet whatever needs arise from their local context. This is effective in ensuring the above processes can enhance the self-determination capacity and social capital of the communities affected by the research of the universities working with them. Finally, this model of universities as gatekeepers with indigenous directed IP centres embedded within them is also perhaps the best context for the realization of the first point in our conclusion. This will enable local consultation processes with indigenous customary legal systems to interact with the legal ‘circulatory system’ of the world and allow for a flow of knowledge, development of cultural perceptual skills and integration of material and spiritual vision (in the university system as well), and empower diverse legal appreciations of IP to embrace globally in a more meaningful manner. Auer, M. (1998). Access to genetic resources and benefit sharing. Biodiversity: a challenge for development research and policy. W. Barthlott and M. Winiger. Berlin, Springer-Verlag. Barsh, R.L. (1999). How Do You Patent a Landscape? The Perils of Dichotomizing Cultural and Intellectual Property. International Journal of Cultural Property, 8(1), 14-47. Berndt, R. M. and Berndt, C. H. (1992). “Cultural Similarity and Diversity”. In Berndt, R. M. and Berndt, C. H. (1992). The World of the First Australian’s: Aboriginal Traditional Life: Past and Present. Canberra: Aboriginal Studies Press, pp 16-24. Bird Rose, D. (1984). “Consciousness and Responsibility in an Australian Aboriginal Religion.” Study of Religions Ninth Annual Conference, Canberra. In Edwards, W. H. (ed) (1987). Traditional Aboriginal Society: A Reader. Australia, MacMillan. Field, G (1950). Senior Yuwaalaraay Elder. Personal Communication, Goodooga Reserve NSW, From Sim, I (2003). Community Elder. Personal Communication, Oral Tradition, Epping, NSW. Maffi, L. (2001). On Biocultural Diversity: Linking Language, Knowledge and the Environment. Washington, Smithsonian Institution Press. Pettit, P. (1996). The Common Mind: An Essay on Psychology, Society and Politics. New York, Oxford University Press. Queensland Government. (2002). Queensland Biodiscovery Policy Discussion Paper.